In 2004, I was making my way through the canned goods aisle at my local supermarket when I heard the opening chords of MercyMe’s hit song “I Can Only Imagine” being broadcast over the store’s sound system. I had two conflicting responses: 1) this song doesn’t belong in a grocery store, and 2) I think I’m going to cry. It’s a bit disquieting to be moved by such a simple song. There’s nothing all that clever about the lyrics or the chords. Lead singer Bart Millard’s vocals are unaffected and somewhat throaty. It’s just a song about seeing Jesus in heaven, but it became tremendously popular, crossing over to mainstream playlists in spite of its overt Christian focus. Astonishingly, “I Can Only Imagine” peaked at number one on the Billboard Hot 100 Singles Sales chart for ten weeks and was the only Christian single to reach over two million digital downloads. I feel about “I Can Only Imagine” the same way I feel about The Shack. That is, if something labeled Christian becomes extremely popular, there must be something wrong with it. I know this is unfair. Still, when you’ve been a Bible-believing Christian in America as long as I have, you learn that the mass market version of Christianity rarely squares with the Bible version, and if some Jesusy thing makes it into the pop culture limelight, it’s probably received so many makeovers as to be merely the distant cousin of a robust biblical faith. I’ve read Daniel Rodash’s Rapture Ready, an appalling expose of the evangelical faith, and was as embarrassed as the rest of us. So it was with trepidation that I entered a theater to see a movie which purported to tell the story behind this surprise hit. Would I Can Only Imagine, the movie, be as inexplicably appealing as the song? I’m happy to report that the movie is as unfussy and straightforward as the composition that inspired it. Bart Millard’s mother Adele (Tanya Clarke) receives the brunt of her husband’s abuse until she leaves the family, whereupon young Bart (Brody Rose) becomes the focus of his father’s anger. Arthur Millard (Dennis Quaid) is a frustrated man who is determined to make his family pay for unnamed injuries he has received. The film explores Bart’s tortured childhood and traces his journey as he attends church camp, is recruited as a reluctant lead in his high school’s musical production, and finally gets away from his savage father by joining a band and going on the road. Interestingly, the filmmakers manage to convey Arthur’s rage without using profanity, presumably to avoid offending Christian audiences. This conversion, and the gradual reconciliation of father and son, forms the heart of I Can Only Imagine. Quaid, the Hollywood veteran, does a creditable job as the crusty, hard-edged elder Millard; newcomer Finley, recruited from the Broadway stage, is utterly convincing. He also does his own singing rather handily. The best part of the movie is that fact that it’s all true. As with most films, some liberties were taken for dramatic affect. But when I checked it out, some of the most remarkable aspects of the story were those which happened exactly as portrayed. The things that made me snort, “Ah, c’mon, who’d believe that?” were the ones which, it happens, actually took place. Filmmakers Jon and Andrew Erwin have wisely chosen to tell Millard’s story as simply as possible. The movie never tries to be more than it is. I never felt manipulated or preached at. The song itself is heard only once in the entire hour and fifty minutes. As a result of this restrained approach, the story is front and center. I Can Only Imagine is a testament to the power of Jesus to change people and renew their relationships. You may cry. And that’s okay. 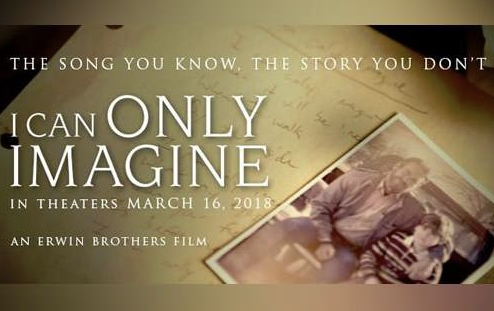 I Can Only Imagine opens nationwide on March 16.